So many of us make concessions in our homes to fit the needs of our children – between rowdy play dates in the playroom to practice sessions of the resident garage band. It may be possible that you chose your flooring with the kids in mind (“we need something durable for the kids”), that you selected easy-to-clean wall paint colors that didn’t show fingerprints (“crayons and greasy fingers are common in our house”), and that you have bedrooms that serve as shrines to your children’s childhoods – reflecting the little people that they once were, not necessarily the people that they are today. Once the kids have graduated and/or married and/or simply flown from the nest, it’s time to reclaim that space to fit YOUR needs as a couple. Chances are, if you haven’t renovated or updated your home since the children were babies or toddlers – your home could be in dire need of an update. Use this opportunity to create a fresh new personality for your home to reflect your new desires and identity as a couple – after all, you’re empty nesters now! Maybe you’ve always wanted a gourmet kitchen that exudes luxury, or a craft studio where you can paint or create to your heart’s content. It’s possible that you dream of a master bedroom, walk-in closet and master bath that emanate serenity. An empty guest bedroom may serve as the new media room or home gym, and the basement that was once filled with drum sets and empty potato chip wrappers may serve as an in-law suite complete with kitchen, full bath, living area and bedroom to accommodate aging parents you’d like to keep close or a bar and entertainment area for epic gatherings with your friends. 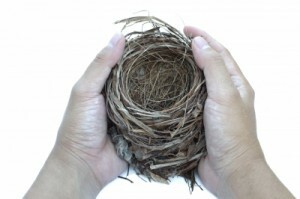 Keep in mind that your nest is not confined to the interior of your home. Outdoor living spaces are all the rage and serve as a terrific extension of your home. Take a long look at your backyard. Don’t you think it’s time to dismantle the playground and transform this space into a terrific outdoor escape. If you’ve always loved gardening – imagine a quaint potting shed surrounded by your unique version of an English Garden with pathways lined with benches for reading and reflecting. If you love to entertain – envision a heated swimming pool paired with a Tiki Bar and outdoor kitchen. If you long to relax – visualize a tranquil koi pond just outside your backdoor, a sprawling covered deck with an outdoor hearth and cozy deep seating set, and an oversized hammock strategically placed in the shade. The possibilities are endless! To reclaim YOUR home now that your little birdies have all flown the coop, we invite empty nesters from all over the Atlanta area – including Peachtree City, Newnan, Buckhead, Alpharetta, Roswell, Sandy Springs, and beyond – to contact the talented design-build team at Highlight Homes today! Our award-winning crew of designers and builders look forward to helping you make your visions of a new nest a reality and can be reached by calling 678-873-9234, e-mailing info@highlighthomesga.com, or filling out our helpful online contact form. To stay on top of the latest Highlight Homes news and specials, we welcome you to “like us” on Facebook, follow us on Twitter, visit our mobile text site when on the road by texting Highlight Homes to 99699, or sign up for our monthly e-newsletter, The Highlight Homes Herald! For a little inspiration, please visit our online portfolio to help you get started. ← 2011 Ends With a BANG!